Audi Sailing Team powered by ALL4ONE introduces new Official Sponsor The First Club on the occasion of Trofeo Conde de Godo in Barcelona (23-27 May), which is the first step of the French-German team 2012’s season. 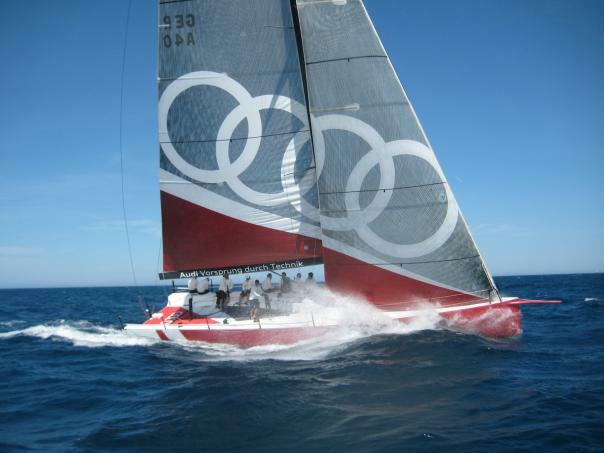 We are honoured to join as a sponsor of the “Audi Sailing Team powered by ALL4ONE”. The partnership with this team is an opportunity for us to continue increasing brand awareness at an international level. The promise of the first club™ platform is to offer the most compelling digital solution to the loyalty, promotional and corporate incentive markets. As the first branded multilingual platform in the space, with millions of downloadable choices anywhere in the world, how you want it and whenever you want it. The platform can be integrated with a Brand’s own loyalty points or miles. the first club™ has provided flexible solutions to international companies such as InterContinental Hotels Group PRIORITY CLUB® REWARDS, Sodexo Group and Edenred with more exciting partnership announcements to come. After the winter preparation that was organised by the Shore Team, followed by a training and tests session in Valencia early May with the sailors, Audi Sailing Team powered by ALL4ONE is now ready to start this new season with a lot of freshness and envy. We are delighted to get a new partner for our project who has been seduced by the similarities between our companies: multi-cultural and technology driven. Like “Audi Sailing Team powered by ALL4ONE”, it is a young innovative and international company that wishes to approach the competition with a new strategy. After the winter works and the first successful tests made in Valencia at the beginning of May, we wish to validate some of our options in Barcelona during our first real racing conditions against our future competitors. This will enable us to keep on developing the boat for the season, which will see us participating to the 52 Super Series and the Kiel Week. Unfortunately Jochen Schümann has not recovered yet fully from a hand injury, and Jordi Calafat finishes its round the world race with “Team Telefonica” (on the Volvo Ocean Race), so we will have a slightly different team for Barcelona. We have therefore found a promising solution as we will host a large part of the crew from the successful former Spanish TP52 “Bribon” on board, which will bring their history and new eye from their experience on another reference of the TP world. We will sail this regatta without pressure and our objective will be to play as many podiums as we can. First of all, it is an honour to replace such a good sailor as Jochen, one of the best ever, and I’m of course very happy to come back into the TPs, and with Audi Sailing Team powered by ALL4ONE in particular, which has been one of the top teams in the Circuit in the past years.I’m glad to sail again the Trofeo Conde de Godó here in Barcelona, which is one of my favourite sailing places. I’m very excited to sail with this crew, some of them are good friends, but all are professional sailors. Anyway, for the Team it is the first regatta this season; so it’s a different approach than for other the teams. There are some crew and boat changes this season, so for this first test the expectations are more on the process than on the results: the main goal is to start working again together, to understand the new boat configuration and performance, and to try to finish the week working as a crew, and well prepared for the next events. As a helmsman, I will fight for every race as always, but with the main goal for the week in mind, as a part of a season that is still starting for the Team. The competition starts on Thursday! the first club™ is the first global solutions provider to present a new, better, and more effective way to offer rewards and build loyalty by delivering relevant, digital content that is instantly gratifying to today’s consumers. the first club™ digital solutions can enhance loyalty, promotions, incentives and any type of rewards programs by offering the latest in premium content that will engage consumers worldwide, with attainable low-level rewards. Consumers can redeem rewards instantly to access the very latest in digital content in 12 languages, including millions of music tracks, mobile phone apps, games, eBooks, audio books, and soon casual games, digital magazines, movies and TV shows to engage with their favorite brands. the first club™ solutions are easily integrated into existing loyalty and reward programs, are cost-efficient and scalable to encourage low level reward redemption, increase customer loyalty and create additional revenues for brands. For more information, please visit www.thefirstclub.net, or the first club™ white label consumer site, www.thefirstclub.com.